Actually luch is not that good vs vehicles because it has an accuracy penalty vs Vehicles. Even m3 with PTRS passenger can threaten it. > Happy to help when I can. > I don't think increased damage and pen would be an issue personally, or adjusting the mg34 to provide more consistent damage. Good suggestions. > I wouldn't want to see its window later personally because the luchs fills a role also of light vehicle killer, mopping up the scout cars and wc51s that light be out and about, pushing the luch later leaves a hole in their lineup where they can be exploited. > Actually luch is not that good vs vehicles because it has an accuracy penalty vs Vehicles. > Even m3 with PTRS passenger can threaten it. Highly doubtful as long as Puma exists in the same tier. Since Luchs is a vehicle that suffers in many situations, why not increase the rate at which it gains veterancy. There will be no need for other buffs then. I think increase its vet speed by at least to 1.5 (more for 2 times) times or more than it currently is because, it does kill as well as T70 does. I did a test on cheat mod, compared the vet gain/speed between the T70 and Luchs when I put for each "100+ Veterancy xp", its rate is the same according to the vet bar. We know for a fact that T70 does better in terms of performance in many more situations meaning that Luchs will have an even more difficult time in getting its bonuses, since its output is worse and has to retreat more in many more situations. I think it should be a lot more easier than it currently is since it feels as it feels difficult/impossible. I played a match not long ago with Luchs , 1v1 against an opponent who was not great, managed to get around 30 kills, but it was still vet 2 or 3, I think 3. I think if anything it needs, that needs most adjustments, it is to the veterancy rate because think it is relatively very slow in my opinion. It feels it is nearly impossible to even reach anything above vet 3 especially getting it to that level. Thats the furthest I have ever gotten and it took me roughly 20min or more for me to get until vet 3. So, what it needs instead in order to perform better without needing any other buffs due to how it suffers in many situations, buff the veterancy rate more!!! Also, have you ever had a Luchs that took that long before it even got proper veterancy? I think that this is another solution to its problems!! @Balanced_Gamer I'd like to see what the vet requirements are before we touched them. It's helpful to be able to compare those to other units because those numbers arent as visible as the rest of the stats. I'm not sure you can lower them any more. The above comes out to about a 25% reduction so idk if going larger than that is a good idea. > Highly doubtful as long as Puma exists in the same tier. Personally, I do believe that the Luchs needs a slight buff to its anti-infantry accuracy and penetration against vehicles like the T70, Stuart, and the AEC. This way, the Luchs won't be such an easy pushover for other LVs. Now, people say that the Luchs is cheaper and comes out earlier and what not; but the temporal advantages are very meager gains compared to what the T70 and the Stuart deliver i.e. effective LV platforms against both infantry and LVs. In the case of AEC, it is effective against even medium armour. Moreover, please refrain from bringing up the Puma as a way of arguing that the Luchs needs no buff as the Puma is a separate unit entirely. In addition, since the Luchs is a reconnaissance tank, it should have additional abilities that make it more relevant in the late game as a spotter for vehicles like the Jagdpanzer IV and the Jagdtiger. Yes Luch window is too small plus its guns are too ineffective. First T70 is later but is of better use. Okw/Wehr is forced into Puma. Luch does not force Allies hand. Getting a Luch and counter by T70, means Okw waste more popcap to buy Puma. Puma + Luch is more expensive than 1 T70 duh. If the luchs "doesn't force people's hand" than you can't say the AEC is an auto-build. @Balanced_Gamer So you want to buff the luchs against vehicles AND infantry? I really don't think you can do that, pick one or the other. If you dont understand this line, then you dont understand the gameplay. Getting a T70 and counter by Puma, means Soviet waste more popcap to buy SU76. T70 + SU76 and Soviet expensive Lighttank tech 90fuel is more expensive than Luch + Puma + Mecha tech 60fuel duh. Luch sight is 40m, vet3 is 50m. Luch in camo mod will be detected in 20m. Thats mean Luch will able to get 30m bonus sight without being spotted. T70 sight is 40m, vet3 is 50m. Recon mod is 50m, vet3 is 60m (disable main gun). For most unit sight is 30m. Thats mean T70 will also able to get 30m bonus sight to spot without being spotted. -Both of them has equal power in scouting. Though Luch is much more risky for it has to go deep to enemy position. But if knowing a flanking path to go deep with camo mod. Luch is possible to kill a Katyusha or low hp Jackson, or any halftrack. Its just require more skill to use Luch than T70 to make it more effective. For it comes earlier. I mean, when I play OKW, the infantry are good. The only problem is that I feel its lack options to choose units that focus on AI areas. If I compare FHT and Luchs. Luchs seems to me as if it were a joke. I feel the only option OKW really has in terms of early to mid is FHT. If you compare to other factions like USF, they have options like M20 Utility Car, M15A1 AA Half-track, M5A1 Stuart, M8A1 Howitzer Motor Carriage. They do very well for their prices and performance, all around from 20 to 75 fuel. I feel those vehicles are all good and balanced for their prices, they have many more options to choose from in terms of AI, some generalists and specialists. I compared STUART and LUCHS, how they both do against infantry, personally, I think STUART is better. It may not be good as T70, but surely is better than Luchs, against infantry STUART is better. It can even defend itself against tanks the STUART because it is a generalist. Luchs a specialist is terrible, performance is worse. Even the M20 Utility Car is something I would definitely pick over for its price and performance. Luchs for its price is terrible, it simply is and performance. There is no advantages in taking Luchs, usually place yourself in a bad position when using it. The only thing Mechanized Base is good for, is Puma and Walking Stuka. Luchs is to me a joke, for price and performance, especially for being a specialist. It does not fit any role other than being incompetent and unreliable. I want the Luchs to get buffed, I think it really needs it. I agree totally with what Reichsgarde stated. Time gap should not be the reason for its temporal advantages and there are only meager gains. Luchs as it is, it is a terrible vehicle. FHT although similar price, durability weaker. It does better for its price and performance, it has better advantages than Luchs. Luchs for its price and performance to me is just like getting a Scout Car. Wehr Scout Car I personally think is better for price and performance than Luchs. It needs to be more potent against Infantry than it currently is, otherwise something else needs improvements because it is utterly horrible. It is an option available, but a choice that seems derelict. Luchs really needs changes simply. Its just terrible as it currently is. Luch needs vet3 to have same 50m sight as vet0 T70 recon...and still needs to move under camo. Vet3 T70 recon has 68.5m sight, not 60! Originally was 95! Lol cheap map hack. 68.5m is way beyond axis armor range fyi..
Cheaper tank, higher disadvantage? Equal scouting? I dont get you. At vet1 T70 has auto recon-capture. I like to see that works on Wehr armor car. Puma is always a wasteful reactive choice with its paper armor and zero AI purpose, I dont see why you need SU76 to counter? SU76 only for P4. What about Wehr which obviously struggle with T70? As can see in GCS, a lot of forced puma. T70 is just too affordable as the game drags on. It even have same target size as armor car, even though its armor is highest for light vehicle. So low popcap, low target size, better armor, very fast, low manpower, slightly more fuel needs, good AI AT, good abilities...needs a relook? If Luch is in good spot, than T70 is in god spot! Another option is to make Luch, Halftracks and Armor car target size smaller 16 instead of sharing 18. Like BalanceG and Reich said, a little time resource gap, but a lot of late game advantages. This is the meta i pointed out for Allies as always. Stuart is an AT light tank, Luch is AI light tank, wrong comparison. Its as compare T70 to Puma. I dont forget, just you want to prove anything i type is wrong. To get the same sight scout effective as T70, Luch has to get in camo and move deep in, which is more risky I admit. Spotlight HT, 5fuel. So which one is cheap map hack? Jadtiger & Pak43 range is 80. Does it way beyond T70 vet3 recon mod? Is Luch a Pre-empt or React light tank? I think Luch should be Pre-empt Soviet for 4mins then also React to T70 to make the game balance. I willing to have Luch get a good buff and then lower Volk's utility (as least remove scavenge & sandbag). Volk is the biggest problem for Allies facing Okw. No you convenient left out vet0 when speak of 50m sight. We know why. Ir ht, 5 popcap, t70 6pop cap. One does plenty of things, the other does basically nothing, you guess which? Sandbag allies can build too, and volks dont have range to make good use of it. If grens,ober build sandbag with out doctrine, than not too fair. Everything I tried to explain is pointless. > No you convenient left out vet0 when speak of 50m sight. We know why. > Ir ht, 5 popcap, t70 6pop cap. One does plenty of things, the other does basically nothing, you guess which? > Sandbag allies can build too, and volks dont have range to make good use of it. If grens,ober build sandbag with out doctrine, than not too fair. You conviently leave out the feul difference of 5 opposed to 70 fuel. For 65 more fuel means the t70 should do a lot of things. The 5 pop is a detterent to spam the ir halftrack. Scavange can deney the enemy taking back wiped team weapons or abbandoned vehicles. It is not so little of nothing. Forcing the enemy to replace units at full price while okw gains recources is not nothing. Not building caches is not a net disadvantidge. I do agree that 0.3 acc on the move for luch seems to low. 0.5 seems a good place to start. C3, i try explain more, you wrote your sentence in way to try support your ending that both scouting are the same. Which i am correcting, is not. If you had put vet0 and also not round down to 60m, unaware readers reading can make a better conclusion. Leveler, i did not leave out fuel difference, C3 already highlight how little fuel IRHT needs, and T70 fuel already posted here. Im highlighting that building IRHT waste your army size. Scavange means nothing because it is unique faction ability that dont break a game. First try not to get decrew, especially easier with Sov. Most decrew team weapon either get stolen or destory. Okw can get another choice for a tiny income. Like with camo Rak, both dont break game. But yet i see Allies players calling to be removed, strange choice when Allies have unique abilities that do break a game or give big advantage. 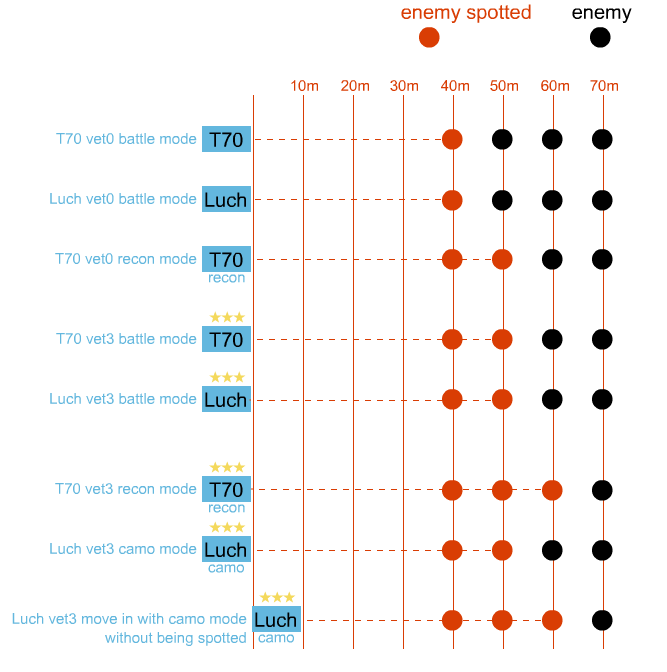 Luch & T70 is quite equal is spotting, just Luch requires more skill than T70. T70 spotting range is the same as SU85 shooting range. No one build IRHT in 1v1 or 2v2 games, 200mp is valuable. In 3v3 4v4, its possible just you pay 10popcap to build 2 IRHT in the total of 400popcap to spot the whole enemy frontline. 4 USF players pay 12/400popcap just to heal. Other factions pay 50-60ammo to get a recon plane for 10sec, while you complain 5popcap to permanently spotting is a waste of popcap. Im telling you I use Pathfinder 7pop cap just to silently spot on Okw BattlegroupHQ. I dont request scavenge to be removed from the game, but only Sturm able to use it. I dont request sandbag to be removed from Okw, but only Sturm able to build it. I believe IRHT works different from pure sight, it is limited by cone size, have slow scanning and gives off your position. Your tanks cant attack into IR range, unlike direct 360 degrees spotting that cheap T70 can do. Place it slightly behind SU85 or Firefly, no Axis even know why they getting sniped. Reasons why remove sandbag from Volk? If anything Brit IS shouldnt build sandbag because they benefit most? USF RE build tank traps, which give same green cover, in double fast time? Only Wehr Grens cant do it. > C3, i try explain more, you wrote your sentence in way to try support your ending that both scouting are the same. Which i am correcting, is not. If you had put vet0 and also not round down to 60m, unaware readers reading can make a better conclusion. > Leveler, i did not leave out fuel difference, C3 already highlight how little fuel IRHT needs, and T70 fuel already posted here. Im highlighting that building IRHT waste your army size. > Scavange means nothing because it is unique faction ability that dont break a game. First try not to get decrew, especially easier with Sov. Most decrew team weapon either get stolen or destory. Okw can get another choice for a tiny income. Like with camo Rak, both dont break game. But yet i see Allies players calling to be removed, strange choice when Allies have unique abilities that do break a game or give big advantage. I see your point on the ir ht. And i missed the he posted the fuel bit already. Imo the issue is that the luchs arrives very early. So early imo forcing early at purchases hampering ai. Now i agree the luchs isent as hard hitting atm, but before it wrecked allies hard. The t70 arrives much later with more squads and at already fielded. It needs to be able to do damage. Sov crew maybe 6 men but the maxim deathloop and bad supression dissipates those 2 models almost entirely imo. Both axis will wipe sov teams faster and more often then sov will wipe axis imo. Any axis that steal a maxim or sov mortar gets a very raw deal. Just not worth it. What unique allied abilities break the game or give big advantidge according to you? A cloaked raketten sneaking across open fields sniping your arty or light tanks or providing vision and just retreating afterwards. And salvaging a team weapon faster then it can be destroyed are both pretty good imo. Being cheesy yes op no. O cp bunkers in team games are pretty cheesy imo. I have already emphasized on the fact that they are already two different types of units. I have made myself clear before. The fact is the Stuart performs more or less on the same level as Luchs does against AI. It is not a wrong comparison if it can combat infantry just as well. Comparing T70 to Puma is definitely two different things. Not Stuart and Luchs. They are comparable in terms of AI. Test the similarities between them in terms of AI. Stuart surprisingly does as well, maybe better in my opinion than Luchs. Luchs in general performs very low in relation to its price. If you compare every other vehicle for its price, there is nothing to really complain about. Like T34 for instance. Around 350 manpower and 90 fuel, great price and efficiency against AI and not bad against AT (slight difficulties against OKW PanzerIV) but its great in performance according to its price. If Luchs has the price it has, it should do better simply. It has one job that it can not fulfill, AI capabilities are poor and does not live up to its requirements. Needs to do a bit more damage, at least 20 and above. Why 16 damage, its terrible and it does hit all the time about 50-70% of time it does in game even when stationary. Wehr Scout car main gun does 20 damage. For Luchs price, the damage should at least be 20, not below. Accuracy is another element which it lacks. OKW has a difficult time countering maxim spam, I have experienced, countered it sometimes but impossible if the player knows how to cover every edge of opportunity. Luchs simply needs to fulfill its role against AI. It needs to do better simply. Since Luchs only fills one role, it should do as well as T70 or better. T70 is a bit more versatile and performs better for its price. It requires improvements!!! I'm glad that you mentioned the t34 and the T70. Both have a very similar cost, but the t34 is undeniably better. This is due to timing and tech costs, the things that are rather low for the luchs. The 222 and luchs use different methods to deliver damage. The 222 uses AOE so it deals 20 damage on a direct hit but it doesn't usually do that, it usually does less due to aoe dispersion. Citing numbers and demanding change gets you nowhere if you don't first understand how the numbers are applied. I did forget mention differences, between the vehicles 222 and Luchs. I appreciate that you have mentioned it. I just feel 16 damage is poor especially when accuracy feel poor on top of it too. This may seem unrelatable but take "Guard Rifle Infantry" (doctrinal) for instance, an infantry unit. Their PTRS hits frequently dealing 27 damage onto infantry units, devastating I would say, it is so versatile that having a blob of these guys would make them nearly unstoppable especially against vehicles. I have abused this technique myself and its great. Great against AT and AI. Costy but worth what comes along with its capabilities. They are the best versatile infantry in my opinion in game. If you compare Guard Rifles Infantry capacity against infantry to Luchs, there is quite an astonishing difference, Completely two different units (JUST TO BE CLEAR), but Luchs having only one main role which is AI, feels very poor. I dont expect it to be deadly but enough so that you can consider it around good or great against infantry. It satisfies neither currently. Tanks are a combination of more than just firepower. The luchs is far more mobile than guards, the luchs doesn't bleed. As you said you are comparing very different units and I'm not sure I want to engage in a discussion comparing heavy infantry and tanks but as a quick aside on it- you are cherry picking 1 of 3 weapons that make up a units composition, the other 2 being bolt action rifles and mgs that you buy as a pair for cheaper than some other mgs. The PTRS is part of the DPS of an elite squad. Other units have lmgs that focus incredible dps on one model, some even on the move so I don't buy picking out one weapon on a squad that relies on being stationary to try and paint a picture. Does the Camo affect its accuracy because currently it does not have any effect according to how many times I have played it. It should have like a 5 seconds period for accuracy bonus when surprise the enemy or something. Currently Camo seems more or less useless. Who uses it and for what purpose specifically if not against infantry. I mean it should get a accuracy boost when surprise enemy out of camo similarly to Jagers. What you guys think for compensation for the way it performs. Camo for Luchs has no real purpose currently, it should either increase accuracy or damage within that 5 seconds period. What say you? It has recon camo, not ambush camo, no bonuses. Luchs camo has exact same purpose as T-70 recon mode, see opponents without being seen/shot at. In 3v3 4v4 game, Camo scout is alot harder to use since Luch has to move deep in. For too many unit of 4 players every where on the map. Its hardly to make Luch works. In 1v1 2v2, there are plenty path without any unit for Luch camo to work. Its possible for Luch to slowly move near the boundary to avoid enemy force, to find and kill arty. T70 has safer way to scout, super great sight at vet3 recon mode, just stay from a distance and watch. But thats the only scout way T70 can do. In team games where you just float resources you can just use map hack HT instead. I'm talking 1s and 2s. you cant deal with a T70 as OKW?!? just built the best PAK in game, the Raketenwerfer 43, maybe even 2 and camo them, make an ambush and because the Raketen has such a good reload you can shoot 4 times at the t70(need 3 hits) when in the right angle !